So, the marathon holiday post's first entry... I had a lovely home cooked (Woolies) dinner with Varen the night I left and then we both headed to the airport. He presented me with some fab gifts before I left: a box of Geldhof Chocolates, a new book (The Boy in the Striped Pyjamas by John Boyne) and a lovely notebook to use as a diary. This last one was the big one. The Divine Miss M inadvertently came up with the idea which she & I had a good laugh over as there was no way we thought any boy would go thru the effort of writing sweet notes for me while I was away - let alone one a day! After telling Varen the story as a joke, he actually offered and said if that was what I wanted most as a gift, he was happy to oblige. Let me tell you that I can honestly say it was one of the most lovely presents I've ever received. It was amazing to be able to read his page (he'd even gone to the effort of aligning it to my itinerary) in the morning and hear his voice and feel close to him while miles away. The best days were when he shared one of his "us memories" with me. Made me all warm and fuzzy inside and really miss him & home! So, armed with all this, I set off for East Africa. I arrived in Nairobi, Kenya early on the morning of the 1st, it was overcast and rainy - not what I'd had in mind for my African holiday on the equator ... but fingers crossed that this would pass, - it is after all, their dry season! I was lucky enough to get my room on arrival at the Hotel Boulevard and went and got some sleep for the first few hours. After lunch I headed to the Giraffe Centre, which was seriously over-priced (might've been because I booked it thru the hotel!) but still a fun experience. 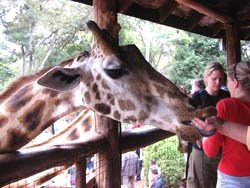 Let me tell you, those Giraffe, they have long tongues!